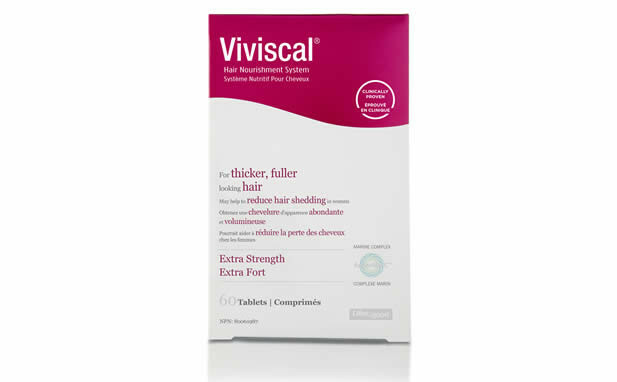 Use Viviscal Extra Strength hair growth* supplement as part of the complete Viviscal range, which provides a unique two-dimensional hair care system fusing the best of both worlds. Viviscal offers scientifically formulated products that promote healthy hair growth* from the inside (Viviscal Extra Strength dietary supplements) plus gorgeous hair on the outside (Densifying Elixir, Densifying Shampoo and Densifying Conditioner). 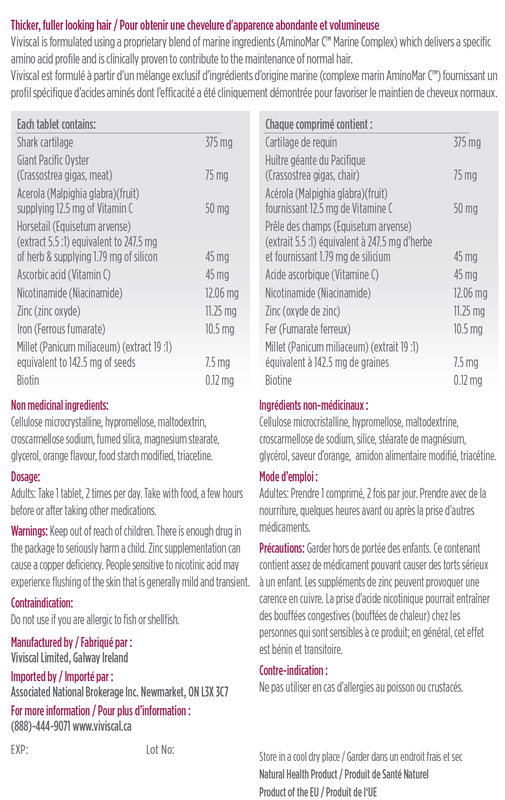 Why Viviscal Extra Strength hair vitamins? Adults: Take one tablet, two times per day. Take with food, a few hours before or after any medications. 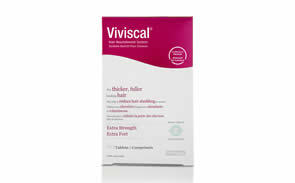 Viviscal tablets are easy to swallow. Do not use if you are allergic to fish. This product has been in contact with soy. Not intended for use by pregnant or nursing women or by any persons under the age of 18. If you are taking medications, consult your doctor or health professional before use. Amino Mar CTM The groundbreaking, clinically-proven marine complex available exclusively in Viviscal supplements. Derived from key marine protein molecules combined with a blend of Horsetail (Stem) Extract and naturally occurring Silica, it provides essential nutrients needed to promote existing hair growth from within. Iron: An essential mineral that has several important roles in the body, Iron helps to make red blood cells, which carry oxygen around to cells in the body, including hair follicles. Thinning hair can be one of the visible symptoms of anemia (Iron deficiency). 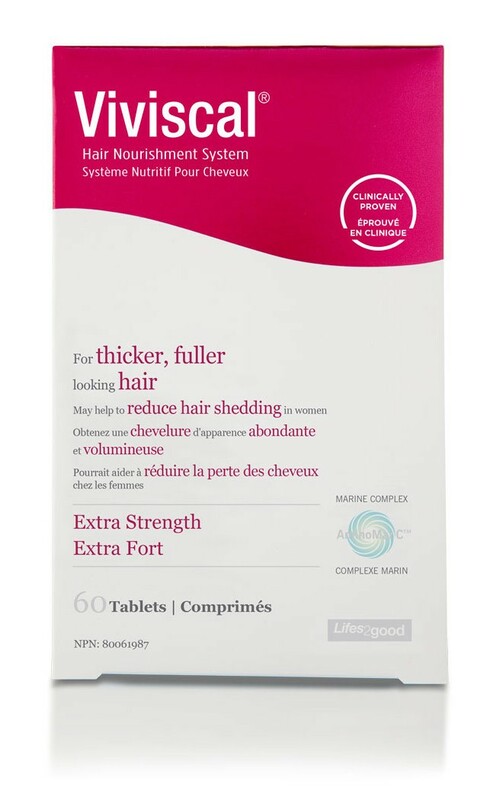 Biotin: Also known as Vitamin H, it is a water-soluble Vitamin B complex (Vitamin B7) that helps the body to metabolize carbohydrates, fats and amino acids, which are the building blocks of protein and thus essential in the formation of the hair structure. Vitamin C: A powerful antioxidant that helps to absorb more Iron into the blood, which in turn promotes hair growth. Vitamin C in Viviscal supplements is sourced from the acerola cherry. Allergy advice: Contains fish and shellfish, not recommended for those allergic to fish, shellfish or seafood. Warning: Dietary supplements should not replace a balanced diet. Children, pregnant or breastfeeding women and those who have recently had a heart attack, surgery or major accident should not consume this product without medical advice. If symptoms persist consult your healthcare practitioner. Use only as directed. Des résultats spécifiques ne sont pas garantis et les résultats peuvent varier.